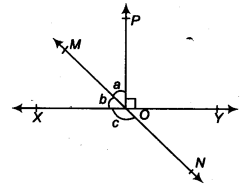 NCERT Solutions for Class 9 Maths Chapter 6 Lines and Angles Ex 6.1 are part of NCERT Solutions for Class 9 Maths. 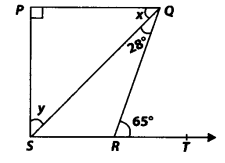 Here we have given NCERT Solutions for Class 9 Maths Chapter 6 Lines and Angles Ex 6.1. 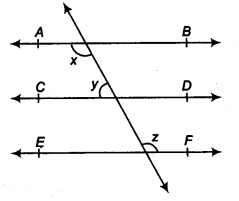 In figure, lines AB and CD intersect at 0. 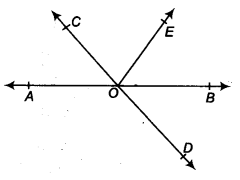 If ∠AOC + ∠BOE = 70° and ∠BOD = 40°, find ∠BOE and reflex ∠COE. Also, AB and CD intersect at O. Thus, ∠BOE = 30° and reflex ∠COE = 250°. In figure, lines XY and MN intersect at 0. If ∠POY = 90° , and a : b = 2 : 3. find c.
Since XOY is a straight line. Thus, the required measure of c = 126°. 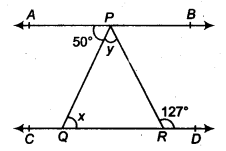 In figure, ∠PQR = ∠PRQ, then prove that ∠PQS = ∠PRT. ST is a straight line. In figure, if x + y = w + ⇒, then prove that AOB is a line. 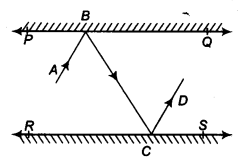 ∴ AOB is a straight line. 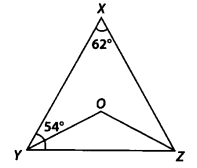 It is given that ∠XYZ = 64° and XY is produced to point P. Draw a figure from the given information. If ray YQ bisects ∠ZYP, find ∠XYQ and reflex ∠QYP. XYP is a straight line. Thus, ∠XYQ = 122° and reflex ∠QYP = 302°. In figure, find the values of x and y and then show that AB || CD. In the figure, we have CD and PQ intersect at F.
Again, PQ is a straight line and EA stands on it. As they are pair of alternate interior angles. In figure, if AB || CD, CD || EF and y : z = 3 : 7, find x. In figure, if AB || CD, EF ⊥ CD and ∠GED = 126°, find ∠AGE, ∠GEF and ∠FGE. AB || CD and GE is a transversal. Now, AB || CD and GE is a transversal. Thus, ∠AGE = 126°, ∠GEF=36° and ∠FGE = 54°. In figure, if PQ || ST, ∠ PQR = 110° and ∠ RST = 130°, find ∠QRS. 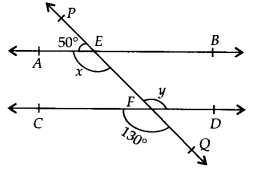 Draw a line EF parallel to ST through R.
In figure, if AB || CD, ∠APQ = 50° and ∠PRD = 127°, find x and y. We have AB || CD and PQ is a transversal. Again, AB || CD and PR is a transversal. Thus, x = 50° and y = 77°. In figure, PQ and RS are two mirrors placed parallel to each other. An incident ray AB strikes the mirror PQ at B, the reflected ray moves along the path BC and strikes the mirror RS at C and again reflects back along CD. Prove that AB || CD. Now, BL || CM and BC is a transversal. i. e., a pair of alternate interior angles are equal. 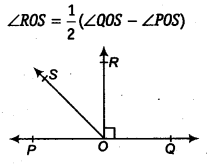 In figure, sides QP and RQ of ∆PQR are produced to points S and T, respectively. 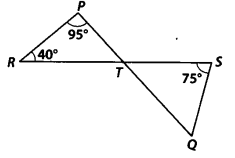 If ∠SPR = 135° and ∠PQT = 110°, find ∠PRQ. Since, the side QP of ∆PQR is produced to S.
In figure, ∠X = 62°, ∠XYZ = 54°, if YO and ZO are the bisectors of ∠XYZ and ∠XZY respectively of ∆XYZ, find ∠OZY and ∠YOZ. 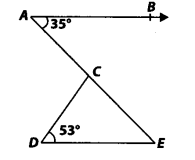 In figure, if AB || DE, ∠BAC = 35° and ∠CDE = 539 , find ∠DCE. AB || DE and AE is a transversal. 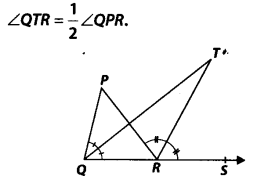 In figure, if lines PQ and RS intersect at point T, such that ∠ PRT = 40°, ∠ RPT = 95° and ∠TSQ = 75°, find ∠ SQT. But PQ and RS intersect at T.
In figure, if PQ ⊥ PS, PQ||SR, ∠SQR = 2S° and ∠QRT = 65°, then find the values of x and y. In ∆ QRS, the side SR is produced to T.
Since, PQ || SR and QS is a transversal. 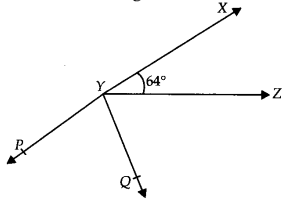 We hope the NCERT Solutions for Class 9 Maths Chapter 6 Lines and Angles Ex 6.1 help you. 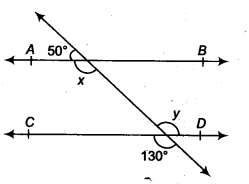 If you have any query regarding NCERT Solutions for Class 9 Maths Chapter 6 Lines and Angles Ex 6.1, drop a comment below and we will get back to you at the earliest.